Kuno Wittmer is now back on board and is lapping at a very solid pace. The Acura remains 10 laps behind but the last few hours have proved that the team and the drivers have the pace to compete at this level and that is extremely encouraging. Meanwhile CJ Wilson Racing fans on social media are proving to be hilarious and highly skilled. Till is back at the wheel of the Unit Nutrition. He is running really solid lap times and through a little bit of risk free strategy from Team Manager, Andris Laivins, the #36 Unit Nutrition/CJ Wilson Automotive Group Acura is now only 10 laps down. Highlight of this period of the race was the Full Course Yellow caused by one of the Lexus entries capturing a advertising board. The CJWR crew did an astonishing job to get the #36 car back out on track losing only nine laps. Marc Miller jumped on board the car now resplendent with an unwrapped replacement bumper. A fact that a number of eagle-eyed fans noticed. Marc's stint has seen him run times that would easily put the car in the Top 10, a fact that is both encouraging and frustrating in equal measure. The whole crew is going to continue to do everything it can to stay competitive and get the car home. Kuno Wittmer drove the whole stint with a damaged and then non-existent left front. The understeer due to the lack of aerodynamic grip was extraordinary and caused real problems in the high-speed corners, of which there are many here at Sebring. He did a full stint before it was decided to take the car back to the hauler to replace the front. As we hit the four hour mark, it was time for Marc Miller to begin his second stint. He rejoins in P16 with the car 11 laps down. Till's forty lap stint in the Acura NSX GT3 was a model of consistency. Sadly, the drama began once he got out of the car. After the scheduled stop for fuel and tires, Kuno Wittmer was released from the CJWR pit box only to make contact with the #52 Prototype. 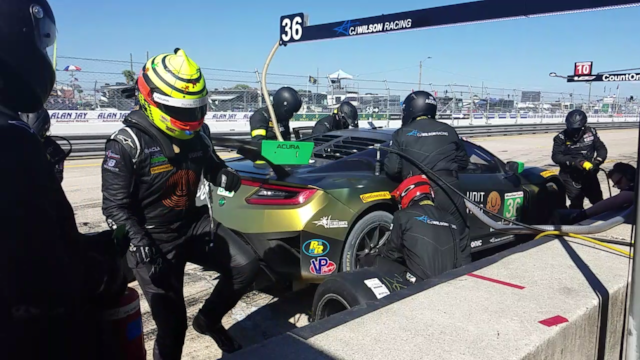 The damage was significant to the left front of the car and to add insult to injury, the incident was deemed to be the team's fault, resulting in a drive-through penalty for the French-Canadian. The repairs will be time consuming and the hope is that they can be done under a long yellow flag period. In the meantime, Kuno is lapping as best he can and is putting in some remarkable times under the circumstances. Prior to his stint, Kuno did a live interview with Andrew Marriot on Fox Sports. Marc Miller spent the early part of hour two in a dog fight with the rest of the front running GTD cars. He held his position in seventh until the Wright Motorsport Porsche dived underneath him at the entrance to T17. Marc was forced wide and this allowed a number of other GTD cars past demoting him to P11. He continued to run a very solid pace and was able to keep in touch with the drivers running in the Top 10. With 1:35 minutes gone and after a solid but personally punishing opening stint Miller pitted the #36 car for fuel and tires. He jumped out and Till Bechtolsheimer jumped in to experience his first ever race laps in the WeatherTech SportsCar Championship at the most punishing track on the planet. A solid an uneventful start for the #36 Unit Nutrition/CJ Wilson Automotive Group Acura NSX GT3. Marc took the Green Flag and immediately settled down with consistent lap times. He even indicated on the radio that the cars in front were holding him up. 10 laps into the 12 Hours everything changed as the #64 Ferrari was involved in an incident with a Prototype and ended up upside down on the outside of Turn 17. The whole GTD field pitted and the CJWR crew did a phenomenal job with their first ever WeatherTech SportsCar Championship live pits stop. The #36 took fuel only and rejoined in P7.